Next: Next post: How many drug trials for Alzheimer’s disease have failed? Why do so many new therapeutic drugs fail in development? Universities UK have issued a booklet which has caused lots of controversy (see the comments on the first link; see this; this; this; this on twitter and there are many more). Since its publication, there has been some public debate on a small component of the guidance: a hypothetical case study (p.27) in which an external speaker on faith in the modern world requests that the audience is segregated according to gender. The case study reflects the challenges of accommodating everyone’s views, from those whose religious beliefs require them to sit separately with their own gender, to those who wish to sit with the opposite gender – hence the mixed seating alternative which is part of the solution in this case study. The issue is how to ensure that no one is unlawfully excluded from the event. 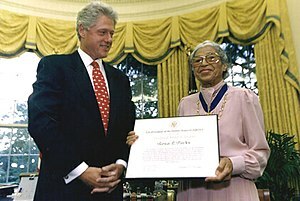 Which leads me to wonder: if a latter-day Rosa Parks refused to be so seated, what would the UUK response be?